There is nothing like ringing in the New Year with friends and loved ones. In fact, Downtown Las Vegas is showcasing a number of NYE2017 events and parties for the entire family. As the epicenter of global entertainment, the City of Lights will feature a myriad of social functions guaranteed to keep you and yours dancing all night long. From champagne celebrations and fireworks to the hottest bands and entertainers. With an array of amazing celebrations for locals and visitors to enjoy. Here are our top picks for the best New Year’s Eve festivities happening in Downtown Las Vegas. Oscar’s Steakhouse at the Plaza will host a fabulous New Year’s Eve Party for one and all. Enjoy the hottest dance tracks and pop music spun to perfection by live DJs in the Lounge. This fun-filled event will feature all night appetizers, midnight Champagne toast, party favors, and stunning performances by Frankie Scinta. There will also be a spectacular fireworks show emanating from the towers of the Plaza. Tickets are only $49 per person and the party goes on till 2 a.m.! From locals to tourists and guests, Party on the Plaza will leave you with NYE memories that will be cherished for years to come. 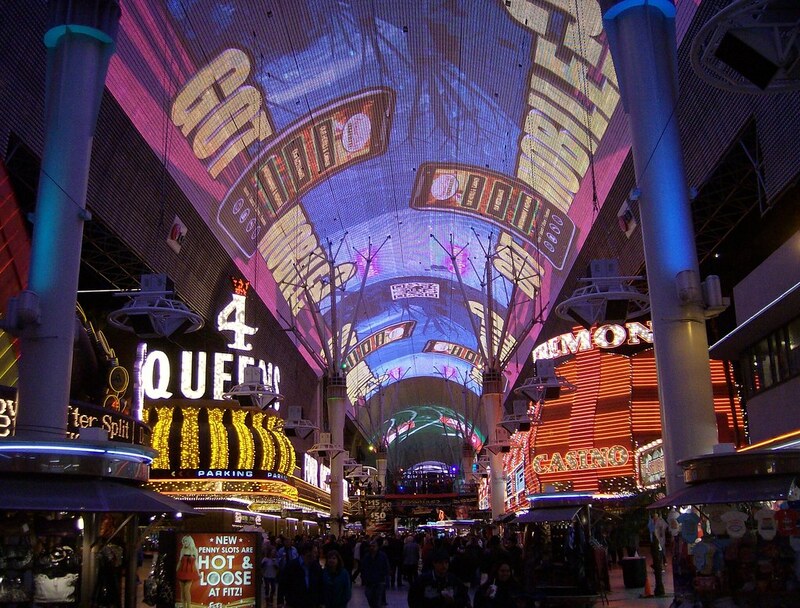 The Fremont Street Experience is truly a NYE party like no other! Just a stones throw from the world-renowned Plaza Hotel, “America’s Party Downtown” will feature 15 bands on three stages. Dance and sing with over 25,000 party goers and usher in the New Year with Mayor Carolyn Goodman. What can you expect to find at this year’s New Years Eve celebration?This open-air extravaganza will also showcase a spectacular laser light show, and the premiere of “Green Day – Revolution Vegas”. With ample parking and plenty of space to party and celebrate, nothing speaks Downtown Las Vegas better than the Fremont Street New Year’s Eve Jam! Immersive, next generation laser light show spectacular from the producers of the Super Bowl, EDC and Life is Beautiful festivals. Fly into the New Year on the SlotZilla Zoomline. With ample parking and plenty of space to party and celebrate, nothing speaks Downtown Las Vegas better than the Fremont Street New Year’s Eve Jam! This year, seven casinos will be letting off rooftop fireworks at midnight. The dazzling eight-minute display will be choreographed to music. For the best view, head to the upper levels of any downtown parking garage. You will be able to enjoy the spectacular fireworks while avoiding the massive crowds on the Strip.Remember, the Strip is closed to vehicular traffic on NYE at around 5:00 p.m., so you’ll want to arrive at your downtown destination before then. If you’re seeking a family-friendly, all-ages celebration in Vegas, there are several options available. At Sunset Station, youngsters can have a great time playing arcade games or bowling before ringing in the New Year. Another option is the group of libraries in the Clark County District, which have celebrations from 11 a.m. to noon that are fun and appropriate for all ages. Backstage Bar and Billiards will feature a live performance by XEB that simply cannot be missed! The band features the ex-original members of Third Eye Blind – Kevin Cadogan, Arion Salazar, Adrian Burley, and Tony Fredianelli. From classic rock to the latest in synth-wave and dance, the Backstage Bar will ring in the New Year with pulsating beats and heart-pounding numbers. Tickets are $25 in advance or $35 the day of the event. There is ample parking on Fremont Street, and all patrons will receive free posters and get to meet the band in person. Be ready for a number of NYE surprises that night as well! Before heading to any of the NYE celebrations happening in Vegas, fuel up with a light meal at one of the Plaza’s restaurants such as Oscar’s Steakhouse or Pop Up Pizza. Dressing for the weather is crucial when it comes to comfort; it’s hard to have a good time if you’re too cold or too warm. Because Vegas winters can range from mild to frosty, layered apparel is recommended. To keep your celebration stress-free, arrive at your New Year’s Eve destination a little early. Last but not least, have fun!Lastly, plan in advance and enjoy reasonable hotel room rates at Plaza while staying in the heart of downtown Las Vegas. Casino rewards programs are a great way to make the most out of your Las Vegas experience. Most casinos now have unique rewards programs with different benefits. The Plaza offers the Royal Rewards program, which provides members with an array of discounts, promotions, and freebies. The rewards start immediately when you sign up for the Plaza’s casino rewards program. Currently, the casino is running a new member promotion; sign-ups will receive 3 tickets to our daily Spin2Win promotion for a chance at 1,000 in free slot play and a free Plaza T-shirt. You can sign up at the casino or simply complete your Royal Rewards registration online. If you love playing the slots, you’ll love the Royal Rewards Program. Ace Tier members receive cash back rewards. When it comes to staying at the Plaza, all rewards program members get the resort fee waived with a comped room. With a discounted room, Ace Tier members have the resort fee waived while other Tier members pay only 2,500 points. Queen, King, and Ace Tier members also enjoy room upgrades (based on availability) and Guaranteed Late Check-out.There are even parking amenities offered to Royal Rewards members. Queen Tier members have complimentary access to the Parking Garage; King and Ace Tier members enjoy Reserved Parking. Valet Parking is also always available for King and Ace Tier members. Earning rewards points is easy! For every $3 spent on Video Poker, you receive 1 tier point. All other games reward 1 point for every $1 spent. Table game tier credits are based on the length of time played and the average bet placed. With Bingo, 1 Buy-in equals .25 tier points. See our benefits chart for all tier rewards details. Sign up for the Royal Rewards Program at the Plaza today and start earning immediately! When you choose the Plaza as your Las Vegas destination, you’re always treated like a VIP. And with the Royal Rewards Program, you can earn like one, too!